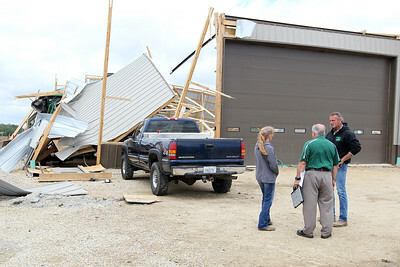 H. Rick Bamman - hbamman@shawmedia.com Peterson family friend Mark Moritz examines the equipment storage building destroyed by Wednesday night's storm. 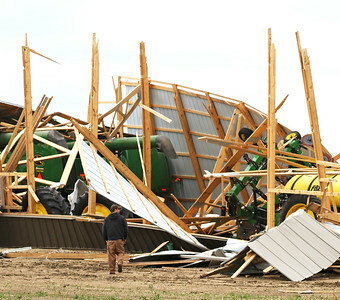 20 pieces of equipment were damaged or destroyed with debris scattered across farm fields on County Line Road west of Harvard. 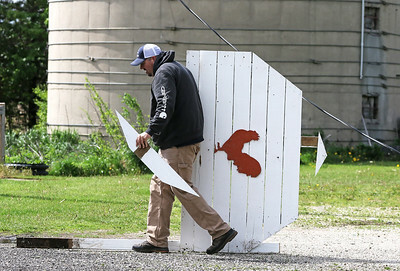 H. Rick Bamman - hbamman@shawmedia.com Harvard area resident Lucas Lonchar carries the farm sign that was ripped out of the ground as he cleans up debris on the Rusted Roost Farm on Thursday, May 19, 2017. Lonchar said it then got oddly quiet Wednesday night and he rushed to the basement with his two dogs, Booner and Mojo. “They say a tornado sounds like a freight train is coming through your house and that’s exactly how to describe it,” Lonchar said. 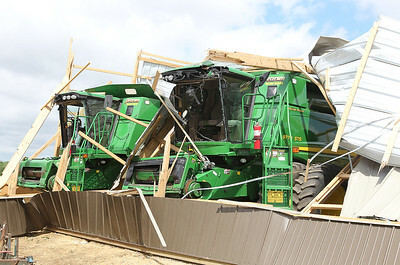 H. Rick Bamman - hbamman@shawmedia.com Two damaged combines sit in the Petersen storage barn west of Harvard Thursdau. May 18, 2017. Barn owner Dawn Petersen had just built their equipment storage barn last summer. 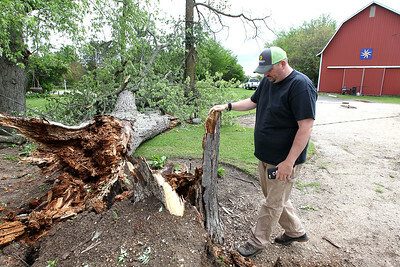 But less than a year later, the barn was destroyed by incredibly powerful winds from a storm Wednesday night. “We just can’t believe it. It’s just so surreal,” Petersen said. 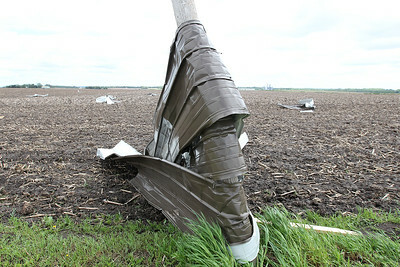 H. Rick Bamman - hbamman@shawmedia.com Siding from the Peterson equipment storage building is wrapped around a utility pole on Conty Line Road west of Harvard. H. Rick Bamman - hbamman@shawmedia.com A grain bin was crushed on Peterson farm land on County Line Road during Wednesday night's storm near Harvard. 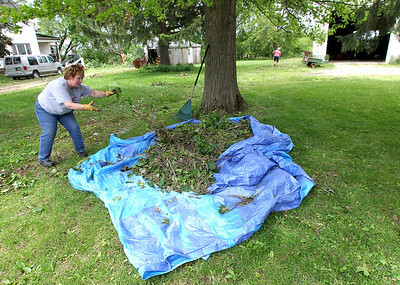 H. Rick Bamman - hbamman@shawmedia.com Capron residents and sisters Pam Mulvenna (left) and Paulette Edson clean up yards Thursday, May 18, 2017 after high winds toppled trees along South East Street Wednesday night. 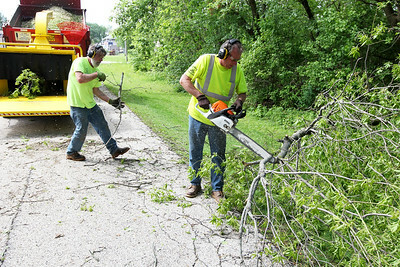 H. Rick Bamman - hbamman@shawmedia.com Chemung Township employees Joe Staver (left) and Bob Nostrum and clear tree debris Thursday, May 18, 2017 on Hickory Street in Chemung. 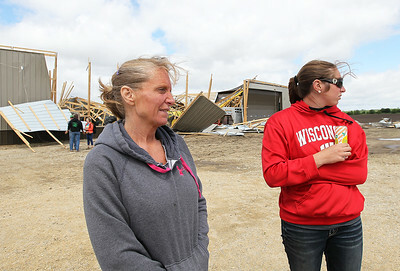 H. Rick Bamman - hbamman@shawmedia.com Dawn and Scott Petersen talk with insurance agent Kevin Kelly of Rockford Thursday, May, 18, 2017 after a strom destroyed their equipment storage barn on Wednesday west of Harvard. 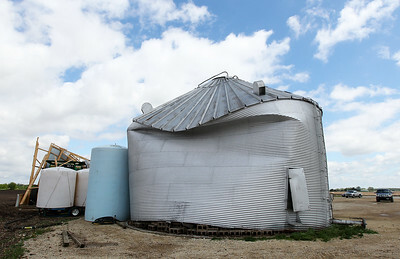 A grain bin was crushed on Peterson farm land on County Line Road during Wednesday night's storm near Harvard.